‘How To Deal With Difficult People’ by Madison Taylor deals with a problem everybody has. I found this book while looking for something else and decided to read it due to its common but catchy title. A quick Goodreads search reveals a lot of books with the same title. This confirms my hypothesis that while many people have solutions, these do not work for everyone. Continuing on the same site, I found out that Madison Taylor has written many ‘pop-psychology’ books. So this made me curious to see how this book was. “How To Deal With Difficult People’ is quite small. I read in one sitting, in about half an hour. The sequencing of the chapters is logical. 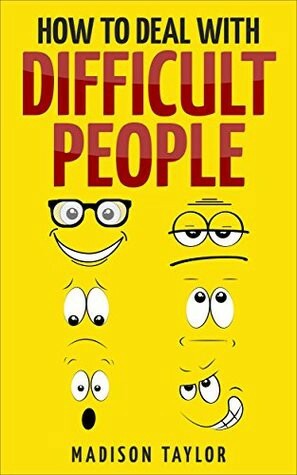 The book starts with the various types of difficult people and proceeds to end with various techniques of dealing with them. So, there is a sense of flow when going through the book. I felt that ‘How To Deal With Difficult People’ was insipid. The advice was superficial and it did not offer in-depth reasoning or thinking. This might work well with tweens or teenagers but not adults.